The twentieth Soundtrack of the Week is Trevor Dunn's Four Films, just released on Tzadik. 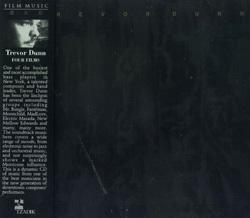 It collects Dunn's music for four different independent films. One of them, V.O., I saw at Anthology Film Archives and afterwards found myself listening to the end credits music at Trevor's MySpace page. I'm very pleased to have it on CD. Check it out, track 4, "End". It's like Ennio Badalamenti or Angelo Morricone, if you know what I mean. There's a lot of different stuff here, rock, jazz, lounge, noise, even a track that reminds me of something Serge Gainsbourg might have done if his life had been a bit different. Trevor Dunn plays a lot of the intruments you hear on the disc — his guitar playing is especially good — but he is also joined by great musicians Shelley Burgon, Kenny Wollesen, Chris Speed and others.